Wikipedia has been shunned for as far as I can remember. In high school I never understood why because it just seemed like Wikipedia’s information was always correct when I compared it to book encyclopedias. As a English Education major, I’ve came to dislike Wikipedia in a sense because it’s been shoved down my throat as a non trustworthy site. While reading Richardson’s Blogs, Wikis, Podcasts…. I discovered just how great Wikipedia can be. Not only is it the most important site on the web these days, but it is an easy collaboration for all. Although anyone can edit anything on the site any time they want their are collaborative groups who set out to make sure all information is correct. I see more people who are better educated and knowledgeable making and editing post on Wikipedia than an average person who isn’t familiar with anything. After reading Wikipedia: Friend, Not Foe by Crovitz and Smoot it shined a even brighter light on Wikipedia and how you can use it to your advantage in the classroom. Wikipedia can give students an opportunity to get involved in ongoing conversations and discussions. Teachers can also let students do research in order to create new wiki entries or add information to an entry already established. I never thought of revising Wikipedia, but it would be a great way to start writing for an audience being that I want a major blog site one day. The article had a a lot of great points and prompted me to spend some time checking Wikipedia’s accuracy about topics that I knew a lot about. As educators, we must come up with new, innovative ways to make students learn and allowing them to explore Wikipedia and use it their advantage is a great way to start. It is very important to let students know the pros and cons of Wikepedia so that they will understand how to effectively use Wikipedia. This will also lead students in becoming a good researcher in the future. 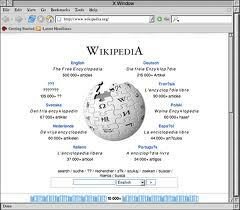 Wikipedia’s edit rate appears at around 400,00 a day, which shows that Wikipedia has become an epidemic, it’s always good to get it on the latest technologies and useful classroom tools!